Back in early October, I showed you the furniture we ordered from Crate and Barrel, and it arrived in time for Christmas! That was a really nice surprise, since we were expecting it to ship in early January. We had to scramble a bit to find a donation site for our old furniture, rearrange a few birthday plans since the delivery date was on Ryan’s birthday, and wait around all afternoon for the delivery truck, but it was worth the trouble and we’re enjoying our new sofa and loveseat. I always have a hard time with change, and even though I was so excited to upgrade to a new couch, it has still been an adjustment for me. I did feel a little sad saying goodbye to our old pieces, but I know they served us well and, hopefully, someone else will get to enjoy them, too. 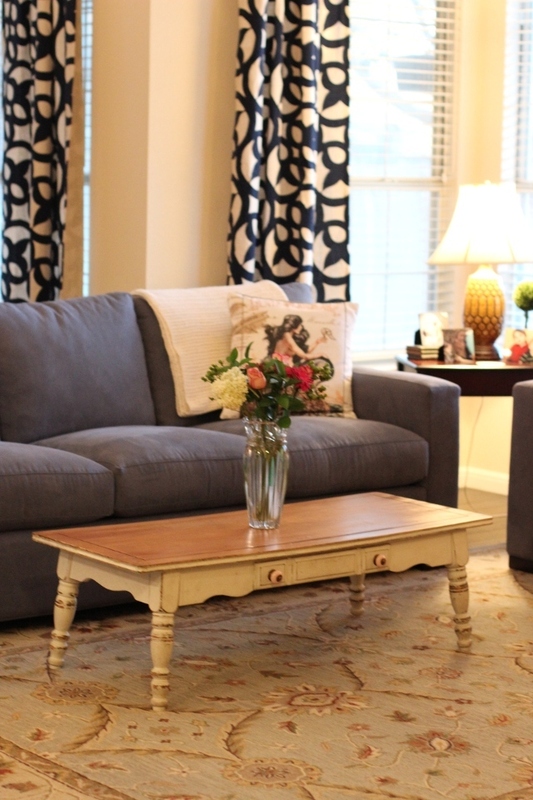 I’m really thrilled with the color and the fabric, but the furniture is really, really firm right now. I know it will soften up in time, since the store model was quite a bit softer, but I miss sinking back into the cushions to watch a movie at night. Right now, I feel like I’m sitting at attention and I have to prop myself up on pillows to get really comfortable. Part of that is probably because, at 43 inches deep, the Axis II is well-suited for taller people. Ryan, who is six feet and sometimes gets back pain from lifting his beer equipment, is absolutely thrilled with the couches and loves their firmness. The color is called Indigo, but is really sort of blueish-grey, and the sueded microfiber is very soft and durable. Since we didn’t get to see an actual model in our color and fabric, but only a swatch, I was holding my breath, but I’m really thrilled with both choices. I’m still making the boys wash their hands after eating before they sit down, and shoes are definitely not allowed on these couches, but I know I’ll loosen up as the furniture ages. This is our family furniture for the long haul, and as Ryan reminded me, we aren’t at the French Cottage stage quite yet. I’m showing you a few pictures for reference, mostly because I couldn’t find any actual photos of the Axis II pieces in Indigo when I was doing my research. I took these shots on our cloudy Christmas Eve, while the boys were playing at the park with Ryan. Normally, things are more relaxed, with toys scattered everywhere. I’m starting to love the combination of blues and I added a few pillows to bring out the colors of the curtains and the rug, at my sister’s suggestion. 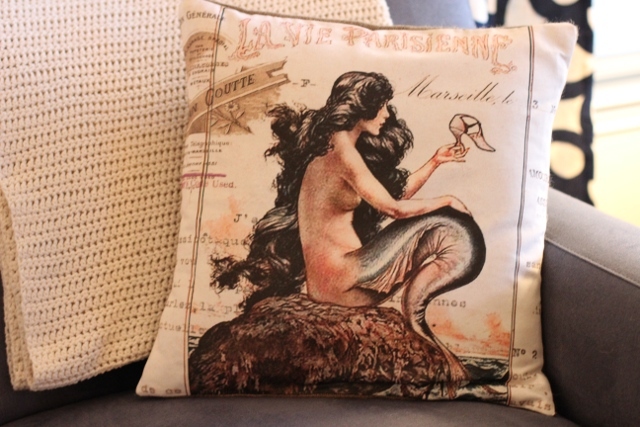 I also splurged on two gorgeous pillow covers from one of my favorite Etsy sellers, Jolie Marche, and the hot air balloon and wistful mermaid add a bit of whimsy to the room. 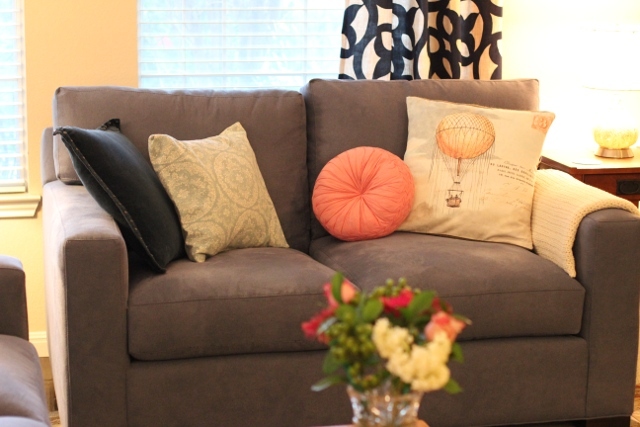 I think it’s really warm and cheerful for a family room, and I know I’ll get those couches to soften up over time. I love the pillows you chose. I checked out that etsy ship and her pillows are amazing. They are so unique! Thank you! I had them saved forever, and I’m so happy I got to try them. They are really lovely. 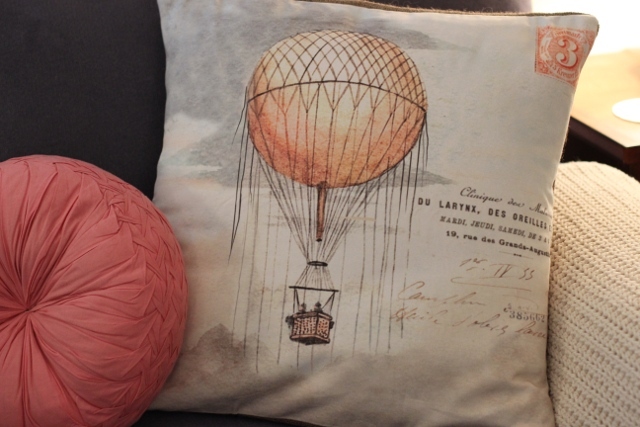 That balloon pillow is too cute! I wish I could keep fresh flowers around, but my cat would eat them in four seconds flat. They look really comfy! And I love your coffee table. Thanks! They are super comfy and I am adjusting to their firmness. How are you liking your Axis sofas after one month? We are just in the process of deciding to buy a new sofa and the Axis is at the top of our list. I also have two small boys (and a boxer) and the sofa will be our main seating area so it needs to be able to stand up to daily, sometimes vigorous, use. Do you feel like the couch is getting more comfy with time? (The firmness is one thing that concerns me.) Are you finding yourself adjusting the cushions every single day since the boys are using them as fort building materials? (I can’t imagine having to readjust the cushions all. the. time. since they are unattached.) While I have these small concerns they are relatively minor nit picky things in the grand scheme of things (good construction, good customer service/warranty etc). Please let me know! I would love to have your feedback before we make the big purchase!! Hi Karen, thanks so much for stopping by! I wrote that post because I couldn’t find many reviews of the Axis. So, a month later, we are really happy with the couch and loveseat! They are very firm, and that did take some getting used to, but they are also really comfortable. My husband has some back issues, and he really likes the firmness. I think I prefer a softer couch, but I’m getting used to it. It’s also very deep, so taller people can sit comfortably on it. My boys haven’t built any forts yet, and because the cushions are so firm, I haven’t had to adjust them at all. And we’ve had a couple of minor spills that wipe right up with a little distilled water and a towel, so I like the cleaning aspect, too. I know a lot of people prefer the Lounge, and I think that would be my first choice, but it is gigantic. Like a twin bed in your living room! The Axis is a really classic design, and I think it will hold up as my boys grow. I hope that helps, and let me know if you decide to get it! Take care. Hi! I love the paint color in this room. Could you tell me what it is? Thanks! Hi, I’ve been searching for reviews of the axis sofa and found your site. It’s been 2 yrs now and I was wondering how it held up. It is super comfy in the store but the best review would be from a family with kids after several years of wear. I don’t have kids but do have cats. I think if the sofa lasted with 2 boys it may have a chance with my cats. Hi Janey, thanks for stopping by! I really love our couches even more now. They’ve held up great to our boys jumping on them all the time and are so easy to clean. They’ve also softened up and are even more comfortable than when we bought them. Hope that helps! I just want to thank you for your review. As you mentioned, it is hard finding reviews for the Axis II and this was the exact color we wanted. We have dogs and an infant, so durability was the key factor. Plus I love the pillows! I’m so glad my post was helpful and I hope you enjoy your new sofa! We added a dog to our family in October and haven’t had any issues with the furniture. I just vacuumed it yesterday and I’m always impressed with how well it cleans up. We are leaning toward the Axis sectional to replace another C&B sectional that did not hold up well at all. C&B is making it right, I’m happy to say! I’m so glad I found your site and that after a couple of years you are still happy with it. My fiance originally liked the Indigo but the swatch looked soooo bright blue in the store. In our house, it doesn’t seem quite as bright, but not as blue grey as I was wanting. I love the color of yours (at least how it looks on my screen), so I may rethink the color. Thanks for posting! 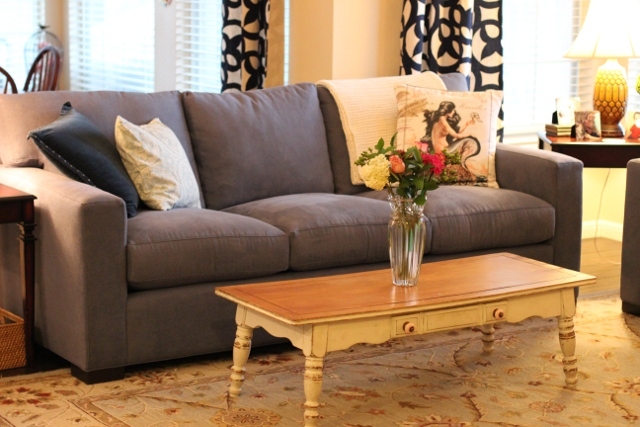 We are about to go order the sectional in indigo. If you get a chance, could you send or post some additional photos to get a better sense of the color. Glad to hear you are still happy and thank you again for your review. It’s been hard to find reviews that aren’t actually on the Crate & Barrel site. We’ll be prepared for the firmness factor as the one in the store is soft and comfy. Hi, Elle. I emailed you a couple of pictures. I really need to do an update, but I’m really glad we did buy the Axis. The fabric and structure have held up incredibly well with two kids and a dog. It’s easy to clean and looks brand new after vacuuming. Hi Catherine. So happy I found your site. I have been going from the Axis to the Lounge. Seriously, back and forth constantly. I came to the same conclusion that you did. The Lounge is just too large for my living room. I loved it but it’s also hard to get up from because it’s so deep and slanted. I also went back n forth on the color. The sectional that I am replacing is a purple do I thought my next sectional would be a lighter color (wheat, pumice, etc) but I could not get excited about them. I kept going back to the indigo. Finally, I have decided to go with the indigo. I thought better to reach out to someone that bought the Axis in indigo and found you. Hurrah!!! For some reason on my computer n cell, your sofa is not showing the indigo as on Crate n Barrel site. Would you consider sending me additional photos of your sofa. I would very much appreciate it. This will be my last sectional as we are seniors. Going with the microfiber bc of our dogs n cats.